Prototype collectors often dream of adding artifacts of seldom seen production stages to their collections. 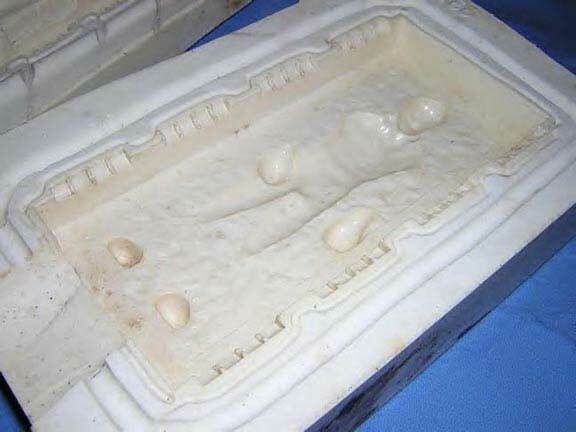 What you see here, an original silicone mold for the 3 3/4" vintage POTF Han Solo figure's carbonite block, is a testament to the possiblity of collectors' prototype dreams coming true! The recent surfacing of this extraordinary prototype is awe-inspiring when one considers the relatively miniscule amount of silicone molds known to exist for 3 3/4" figures of the vintage era. Fewer than ten characters are known to have molds for a portion of the figures. 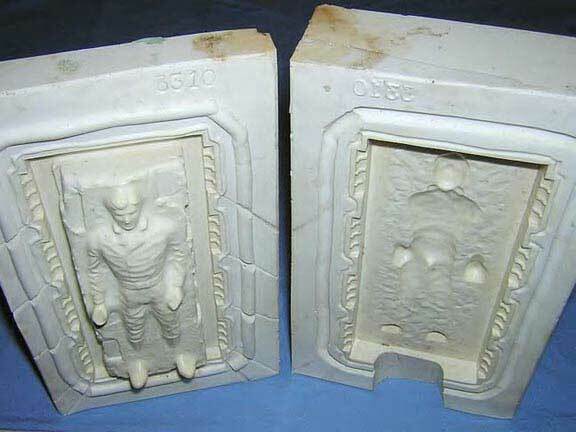 Along with this fine mold, a Rancor Keeper torso, alternate Han Carbonite block, and Walrusman head represent the other 3 3/4" figure silicone molds available for viewing on the Archive. 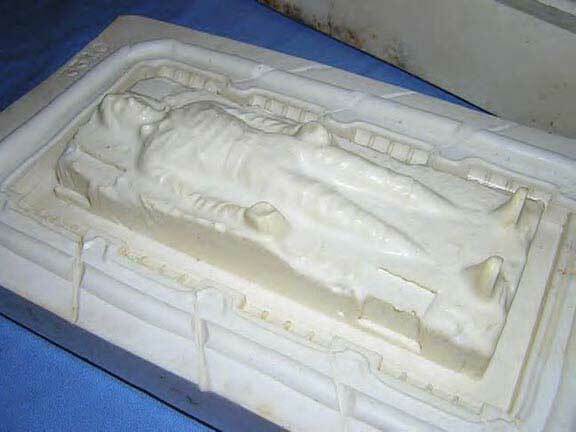 The silicone mold is initially crafted utilizing the original sculpting. The main purpose of the mold serves in the creation of hand cast urethane hardcopies. Both mold halves are joined together to allow the pouring of liquid urethane through an opening in the mold bottom. Once the urethane solidifies the mold halves are seperated and the hardcopy is removed. A pliable material like silicone is essential in facilitating the removal of the hardcopy from the mold. These molds represent an integral portion in the figure production process and as such are highly coveted by prototype collectors. Above we see a close-up view of one mold half. As one can clearly see, this half consists primarily of a raised positive image. This was necessary in order to create the hollowed out back portion of the carbonite block where the figure fits into the carbonite block. In contrast, a silicone mold for the actual Han figure would contain negative cavities in both halves. A myriad of small, thin channels extend to the outside of the mold allowing trapped air and excess resin to exit the cavity section. Without these channels air pockets could form, thus rendering the hardcopy unusable. Lastly, take note of the raised rectangular area running along the outer portion of the mold cavity. This portion, referred to as a "key", allows the two mold halves to line up properly during hardcopy casting. The key on the companion mold half is negative allowing the positive key to join with it. Here we view the second mold half. It contains details for the front of the carbonite block. Unlike the previous half, the mold cavity portion is primarily negative. 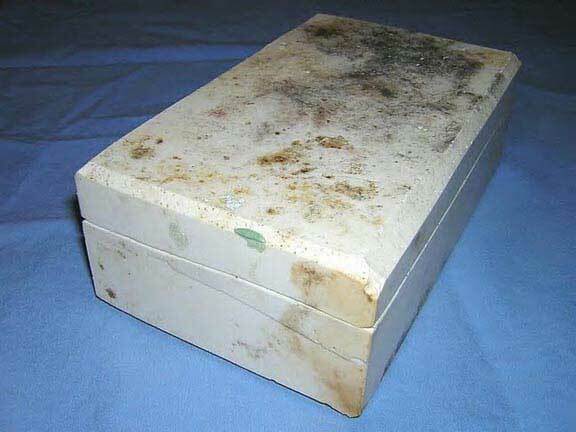 The photo above, taken at a downward angle, shows both mold sections. The detail incorporated into the mold is absolutely stunning. 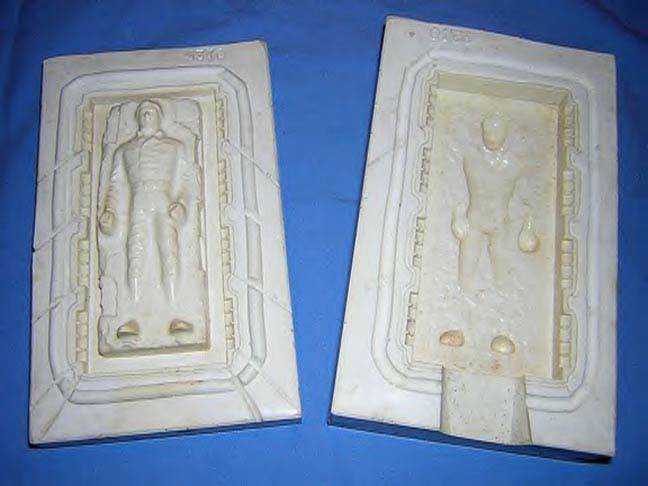 I can easily envision how incredible the hardcopy carbonite blocks must look that were created during the vintage era from this mold. The view above provides the first glimpse of this particular mold with both halves joined together. 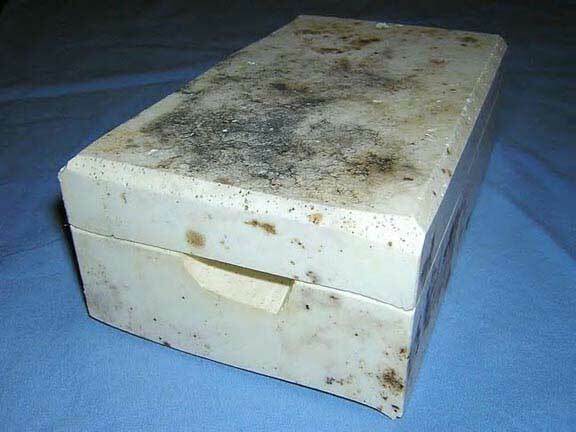 Viewers should note the presence of an open area located at the mold bottom. This opening, properly referred to as a "gate", allows liquid urethane to enter the mold in order to fill the figural cavity. This gate style present is fairly consistent with the Micro Collection molds which have surfaced. Excess urethane hardens in this gate and is often referred to as a "pour stem". The pour stem is filed down completely after the hardcopy is cast, but a rough surface will remain where the pour stem once existed. The last photo clearly shows the presence of residual green urethane, likely dynacast, on the outside of the mold. I'd like to specially thank Tracey Hamilton for sharing the photographs of this wonderful prototype and for choosing the Archive as the platform for showcasing this special piece from his collection.